A mole is a unit of measurement used in the chemical sciences. Moles work in a similar fashion as the term “dozen”. A dozen of dogs = 12 dogs. A mole of salbutamol = 6.022 x 1023 molecules of salbutamol. 6.022 x 1023 is Avogadro’s number (NA), sometimes referred to as Avogadro’s constant. The International Union of Pure and Applied Chemistry (IUPAC) defines the mole as the amount of substance of a system which contains as many elementary entities as there are atoms in 0.012 kilogram of carbon-12. These entities may be atoms, molecules, ions, electrons, or photons. Because it can get awkward to express the number of entities using Avogadro’s constant, the mole is typically used. One mole of sodium (Na) atoms = 6.022 x 1023 Na atoms. One mole of potassium (K+) ions = 6.022 x 1023 potassium ions. One mole of haloperidol = 6.022 x 1023 molecules of haloperidol. What is the connection between mass and mole? This is when moles become useful as the unit mole acts as a bridge between the the number of entities and the mass. In order to interconvert between the number of entities, mass and moles, we need another number called the molecular weight. The molecular weight (Mw in g/mol) is the sum of atomic weights of all of the molecule’s atoms. In order to answer the question above, we will need to work out the molecular weights of ibuprofen and mefenamic acid first. You will need to look up the chemical formulae of the two drugs and a periodic table of elements for this! 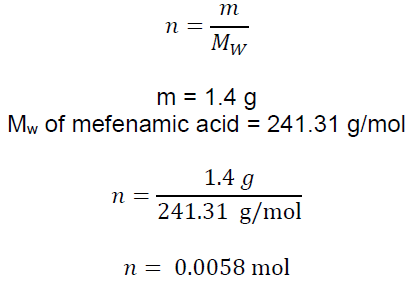 As an example, we will determine the molecular weight of mefenamic acid. Step 1: Determine the chemical formula of the compound. Step 2: Find the atomic weights (periodic table needed) of every atom in the molecule. With enough practice, you will be able to remember the atomic weights of the atoms most commonly encountered in the field of pharmaceutical science! Step 3: Calculate the molecular weight (Mw) by determining the sum of the atomic weights of the atoms of the molecule. Mw of mefenamic acid = 15(12.01) + 15(1.01) + 1(14.01) + 2(16.00) = 241.31 g/mol. Q1. 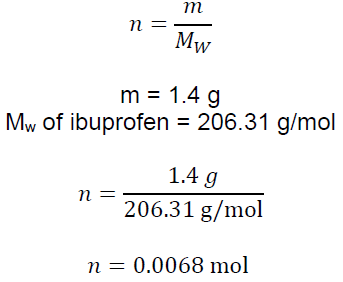 The molecular weight of ibuprofen is 206.31 g/mol. 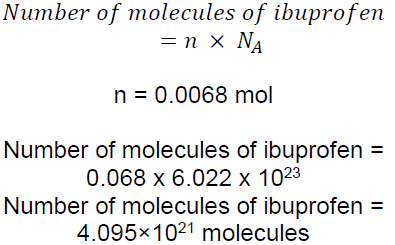 Show how to determine the molecular weight of Ibuprofen given that its chemical formula is C13H18O2. Q3. The structure of cefdinir (third-generation cephalosporin) is shown below. i) From the structure, determine the chemical formula of cefdinir. ii) Calculate the molecular weight of cefdinir. 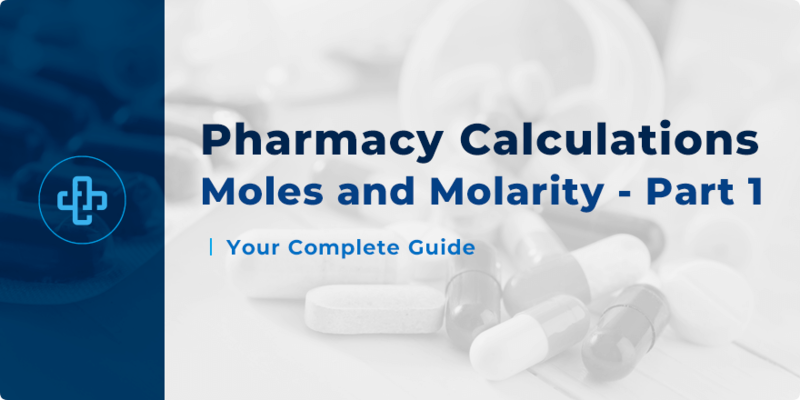 Now that we know the molecular weights of ibuprofen and mefenamic acid, we can calculate the number of moles in 1.4 g of each of the drugs. We will do this using the formula 1 below. We also showed the mathematical relationships between mass, molecular weight and moles in formulas 2 and 3.
where n = number of moles (mol), m = mass (g) and Mw = molecular weight (g/mol). Note: Some textbooks and websites may use different symbols for moles, mass and molecular weight but the concept remains the same. Tip: You really only need to remember one of the formulas. With a bit of algebra, you should be able to figure out the other two! Using Formula 1, let’s calculate the number of moles in 1.4 g of ibuprofen and mefenamic acid. So, there are 0.0068 mol in 1.4 g of ibuprofen and 0.0058 mol in 1.4 g of mefenamic acid. 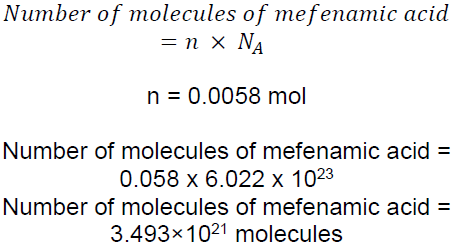 To answer the question, let us determine the number of molecules in 0.0068 mol of ibuprofen and 0.0058 mol of mefenamic acid. Now that we have figured out the molecular weights, the number of moles and the number of molecules, we can now answer the question at the start of this section. No, there are 4.095×1021 molecules of ibuprofen in 1.4 g ibuprofen and 3.493×1021 molecules of mefenamic acid in 1.4 g of mefenamic acid. Where m = mass (g), Mw = molecular weight (g/mol), n = number of moles (mol) and NA = Avogadro’s number (6.022 x 1023).